By Bruno Barber with Craig Halsey, Marek Lewcun and Christopher Phillpotts. Museum of London Archaeology Monograph 68. £ 30. The recent rebuilding of the Southgate shopping centre replaced the infamous shops of the early 1970’s. These were part of the destruction of some of Bath’s Georgian architecture, memorably written up as the “Sack of Bath”. This rebuilding provided a unique opportunity to excavate an almost archaeologically unknown part of Bath, south of the Roman and medieval city. The findings have now been published in this monumental monograph. Some of the discoveries are already known to the society because they were presented to a well attended BACAS meeting in October 2009, by Bruno himself. This was a huge investigation which involved up to 66 archaeologists, 6 finds processors and nearly 30 contributors to the book. In the report the authors emphasise the constraints in their investigation so substantial areas of the building site were not excavated. As with other excavation reports there was the risk of being overwhelmed by the data, especially for the amateur reader. After an introduction the book starts with detailed and extensive results of the geoarchaeological investigation. 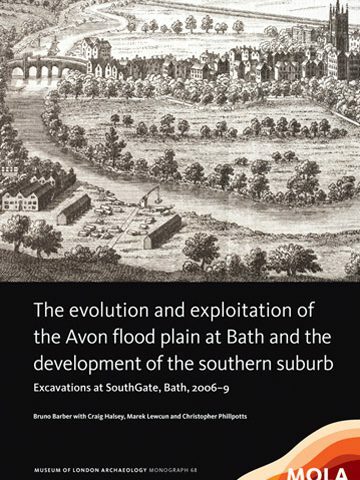 This concerns the formation of the local River Avon flood plain and the “shaping of the landscape”, related to the climatic events from the late Devensian to the Holocene. This is important and new information but rather specialised and some of it is difficult to follow. An area of dry land was left in the south-east of the site, suitable for human occupation. Here localised spits of excavation and sieving revealed 16,000 Mesolithic lithics. Unfortunately detailed analysis was not possible because of the disturbed contexts. However these important finds were interpreted as possible Early Mesolithic winter occupation, around 9000 BP and then possible Late Mesolithic hunting. Following this there was a “remarkable” lack of post-Mesolithic activity and a “near-absence” of later prehistoric or Roman activity on the site. There was no obvious reason for this and it must have been a disappointment to the investigators. After the prehistoric period the book proceeds chronologically in separate archaeological sequences, each with a wealth of interesting documentary evidence, then the archaeological evidence and finally a discussion. The sequences are Roman, Post-Roman, Saxo-Norman (which is clearly the largest section), later Medieval, post Medieval, 17th to 18th C, Georgian, 19 th C and finally 20 th C. ( Documentary evidence is not given for the 20th C). The authors write that the story ends with two destructive events : the Baedeker bombing raids of WW II and the building of the first Southgate shopping centre! There follow about 20 fascinating and detailed specialist appendices on subjects ranging from animal and plant finds to clay pipes. Space precludes any attempt to summarise these findings. However the few pages on the Roman period end with the familiar speculation that the area might have had some religious or ceremonial status. The largest section covers the Saxo-Norman period, c AD 950-1300. In this period, though not well dated, a causeway was built across the flood plain, presumably carrying a road and therefore a bridge across the Avon. In addition an artificial watercourse known as the Bum Ditch was constructed. It was thought to have been a flood defence and mill race. There was also gravel quarrying and limited archaeological evidence to support the documentary evidence that the first buildings were after AD 1250. Detailed environmental sampling of the deposit sequence of the Bum Ditch helped to understand the development of the Southgate suburb. There was clear water in the late 11th C, then faeces and refuse were deposited from the mid 12th C. As the suburb developed, the water deteriorated and then provided evidence of local cloth trade and fleece processing. By the 17th C the water was foul or dried up and then the ditch was built over in the late 18th C.
So the book is full of many interesting topics about Bath and it is of particular interest for the neglected medieval period of Bath, as opposed to the more familiar Roman and Georgian periods. It is very well presented and illustrated, but the detailed archaeological findings are not always a light read and it remains primarily an excavation report of specialist interest. NB: Museum of London Archaeology (MOLA) kindly provided the Society with a free copy to review. The book can be purchased at their website.